College costs - what does Obama want to do? 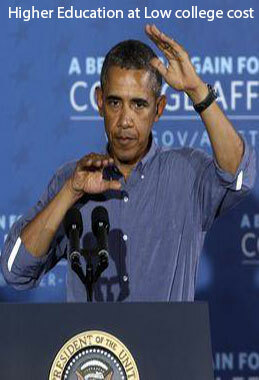 Is Obama's proposals to control college costs for students and families – really effective or not? Is Obama's proposals to control college costs for students and families – really effective or not? It's been more than a week that president Obama announced the proposed education plan about college cost - to be implemented in coming years - but it seems that Americans and specially traditional educationalists are not in sync with suggested plan of action. The plan has been in headlines of articles - receiving a lot of apprehension - making us to believe that proposal was prepared without taking these educationalists and people of America in circle of trust. Everyone has started putting across their reasons for being skeptical about new plan including; College costs - what does Obama want to do? Is Obama's proposals to control college costs for students and families - really effective or not? Schoolanduniversity.com has been on a constant watch to keep their students abreast latest developments. We have tried summarizing some of the current questions - current events -views and answers to entire scenario from daily newspapers - online world news channels about Obama's college tuition plan. President Obama wants to collect data for rating colleges. Schools and colleges would be gauged for eligibility of dollars - purely based on results they achieve, in form of percentage of students who attain successful graduation - their successful careers post graduation - and not the count of graduates. Government wants colleges and schools to help students from low income families - keeping tuition costs low - but how? Entire plan revolves around most important aspect of rewarding schools basis assessment - but how - when and who would judge schools is yet to be decided it seems or may be schools and colleges are yet to be updated about entire process - leading to a edgy situation. Obama's speech was assertive enough to convey that government is in mood of rolling out college ratings by 2015 academic year - which will initiate eligibility determination of colleges starting 2018 - giving ample time to government and college authorities for resolving bumps in the carpet; if any. Biggest notion yet to be cleared in minds of all is why would colleges be a part of it - what about those colleges who don't intend to join and how does this joining or non joining to new college cost plan affect students. If Obama succeeds in implementing this plan - a separate $ 1 billion dollars is what he intends to spare as an incentive for participating colleges to maintain their high education - low tuition cost budgets. We all are aware that American government shells out approx $1.5 billion dollars every year to colleges as Federal student aid - and it is obvious that schools and colleges not participating in this plan will have to lose out on this Financial Aid, making it nearly impossible for them to survive. Students will be affected but not to an adverse extent as the right to choose school and college of their choice is still with them. Only difference - if the plan is implemented successfully - would be that Better Performing Colleges would be rewarded higher aid which will reduce gradually for schools with low performance - hence it is in hands of the students to decide whether they would want to sail with the stream of low college cost plan & selecting appropriate school or college or university, to get Higher Education at low tuition costs or the other way round.